So, after a scuffle, Martha knocks her out - but does safely deliver Althea (she doesn’t hate Althea because Althea doesn’t help people - she trades for their stories which isn’t the same as help) to the rest of the gang with a video of Martha saying… well the same thing she’s always been saying. Let’s face it, Martha isn’t exactly a person with multiple messages and themes. 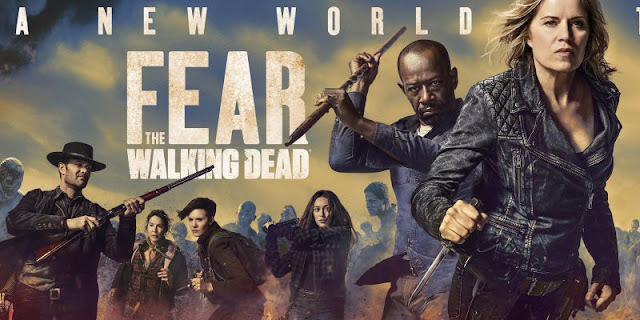 But the gangs together and Morgan tells them all about Alexandria and it’s time to head there - but on the way they’re going to Polar Bear’s truck stop so they can pick up boxes and still help people. Except Morgan wants to help Martha, even though she’s sick, even though she’s dying, even though she continually trying to kill them over and over and over again. Morgan wants to help her and decides to go off alone to do that. John agrees to wait with the rest at the truck stop for 2 days before coming to find him. That gives them time to reflect on moving on, building a new future, making up for the bad stuff they’ve done and for June and John to have an “awww” moment. But drama - all of the gang at the Truck Stop are suddenly horrifically ill and awful and call Morgan to say something’s wrong. It turns out that Martha has poisoned the bottled water with antifreeze as punishment for them helping people. Morgan steps on it to try and get back as soon as possible to tell them (his walkie doesn’t have the same range as the Truck Stop’s transmitter) - and Martha drives them off the road. He then staggers off on foot (did he even try to drive the car? ), fighting zombies, hobbling, desperately trying to help his friends. He does get close enough to call them and tell them what they’ve been poisoned by - and June knows ethanol is the cure. They have a tanker of that but when they all fight to recover it, working together, rescuing each other, they end up losing it when Althea has to use the Big Guns on her truck to clear out the zombies. Sure there’s a lot of bullet holes in the tanker but the liquid is flowing out - it’s going to take at least a few minutes for it to drain empty - go! Collect the flowing liquid! Yeaaah I’m cynical but this hail mary ending is a little dubious. And is there even sufficient ethanol content in beer for it to be the cure? Especially American beer? Personally I think making dying people drink American beer is just additional cruelty. Which I can understand because the writers have to realise they can only drag out “travel across country in a big truck” for so long. Morgan decides that the whole reason Martha became what she was was because she needed help and no-one was going to offer her any. He wonders how many people out there need the same. Also most of the cast (not quite so much Sarah and Wendell) are seeking redemption or amends at some point. And Alicia wants to rebuild her mother’s legacy of creating a safe space for people to grow and develop - and so they take over the denim factory that Polar Bear was based from and decide to use all of Althea’s interviews to find people who need help and help them. I also like Morgan as the protagonist and hope he stays that way - and here is where I do worry. If Fear the Walking Dead is truly rebooting then Morgan will live and this will become a whole new story with a Black protagonist and a positive, moral outlook. If this is just an interlude, then Morgan as moral centre and a Black man is going to die which is a problem. I do like how we’ve seen Wendell who both adds to the racial diversity and brings some much needed disability representation to the show in a way that continues to uphold him as useful and capable. They didn’t bring in a disabled character for him to be a burden or problem for the group - he contributes and helps and is a valued member of the team. I also really appreciate that they have chosen an actor who actually uses a wheelchair and aren’t using an able bodied character to play disabled.